I'm navigating through uncharted waters. Ava's pediatrician recommended that I supplement her with vitamin D drops since you can't get that from diet and it's not safe to expose baby's tender skin to sun. The latest recommendations from the American Academy of Pediatricians (AAP) are that breastfed babies have 400 IU of daily vitamin D supplementation to prevent infections and a condition called Rickets. Our pediatrician recommended TriViSol in Ava's one-month visit and then again in her 2-month visit. Why Vitamin D? I've seen lots of health news recently about vitamin D deficiency, which in babies can weaken their bones and delay crawling and walking. Very few foods offer vitamin D. The primary way we get vitamin D is by sun exposure, without sunscreen, which allows your body to synthesize the hormone. The amount of time is dependent of the darkness of your skin. In deciding whether to supplement Ava, I consulted the Le Leche League's position, since their positions are typically aligned with the AAP and have the best interest of breastfeeding moms and babies. Their position is that mother's milk can be tested for vitamin D. I've continued to take a daily prenatal vitamin to ensure that my nutritional stores are strong to produce high quality milk for Ava. Now, I'm considering having my milk tested so I don't have to supplement Ava. Regrets. I bought it and now I want to take it back. After the two recent visits and getting the same recommendation to supplement, I went to the Target pharmacy to get the TriViSol that the doctor recommended. 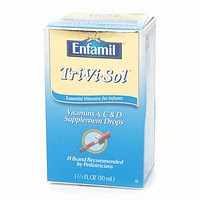 I horrified when I saw that the product brand is Enfamil, the formula company. The $13B baby formula industry falls prey to moms that are exasperated while trying to nurse their babies. It's in their best interests when moms fail to establish and continue breastfeeding. They give the "free gift" at the hospital to breastfeeding moms that includes a sample of their formula and a little book that says it's OK to supplement your child. Can you tell I'm upset? While I know women that despite their heroic efforts to get lactation resources and support to exclusively breastfeed, could not do it without supplementing. And you have to feed your baby. I get that. But, Enfamil is wanting and EXPECTING women to fail at exclusive breastfeeding. I'm blessed with a very abundant supply of milk so if Ava and I continue what we're doing as a nursing pair, she'll be exclusively breastfed for as long as she needs. Yep, that means I might be nursing a toddler, too. What fires me up is that Enfamil is selling this product to the breastfeeding moms market segment and their marketing messages are enough to make me crazy and angry! Their product marketing manager should be ashamed of themselves. The dosage directions state "Drops may be given by dispensing directly into the mouth. Drops may also be mixed with formula, fruit juice, cereal or other foods to increase your child's acceptance." Where is the mention of expressed breastmilk? The completely avoid it! They start with formula, which is not a surprise since that's their cash cow product, but "OTHER FOODS." Excuse me, but babies are born to drink breastmilk. It's completely unacceptable. The product marketing manager for TriViSol is a moron. I'm still undecided on what to do. I'm going to investigate getting my breastmilk tested for vitamin D. I don't want Ava to miss out on vital nutrition, but I also don't want to supplement her needlessly. By the way, I just found a really good resource page on Kellymom.com about how rare it is for moms to be deficient in vitamin D in Western countries or women and babies with lighter skin. I bought the multi-drops and used them once or twice. They smell gross and I didn't even think about the fact that they were made by freakin' Enfamil. Eww. I really think a walk outside a few times a week or sitting in a sunny window is enough, but I'm sure there are rare instances where that isn't the case. But I think the straight up D drops from Whole Foods would definitely be better than a multi. Just too much junk in there for my liking.